Give the GIFT of INVOLVEMENT: Any contribution to Friends of the Island Fox, Inc. supports island fox conservation and education. Any amount you can give is important. 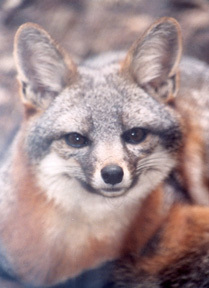 Currently on San Miguel Island there are 20 foxes in captivity and 77 in the wild, for a subspecies total of 97. National Park Service lead biologist Tim Coonan says, “The last time we had close to 100 San Miguel foxes was in 1996, so that's a pretty significant milestone. The wild foxes include 25 pups born in the wild this year. 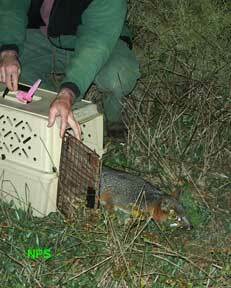 Our camera monitoring indicates that 12 of the 13 pairs we monitored had litters.” Traps with food are put out to attract foxes to locations with cameras, so pups born in the wild can be counted. Island foxes returned to the wild are breeding very successfully. But before an island fox can be released it needs a radio collar so its safety can be monitored. 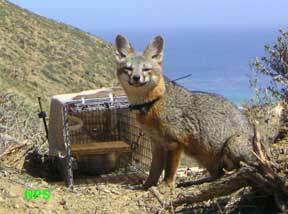 This month 16 more foxes were released into the wild on San Miguel Island. It is hoped that captive breeding on this island will be unnecessary by the end of 2007 and that all of the San Miguel foxes will once again be roaming free. With the donation of funds for a radio collar, you can help make this happen. 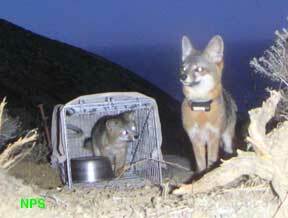 Radio collars are vital to the 13 captive foxes released back into the wild on Santa Rosa Island this fall. Monitoring the foxes allows biologists to rapidly respond when a fox is preyed upon by a golden eagle. Since the capture of two adult golden eagles this summer, only two juvenile golden eagles have been seen on the northern islands. No fox fatalities attributed to golden eagles have occurred since March 8, 2006. 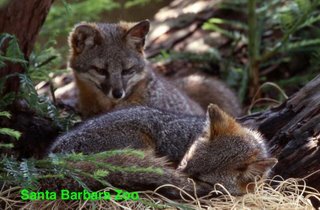 Currently there are 28 island foxes in captivity on Santa Rosa and 52 in the wild, including 14 pups born this year to 5 litters. Captive breeding will continue on Santa Rosa for a couple years. Educating the public about the complex natural balance on the Channel Islands - the importance of removing feral pigs, reintroducing bald eagles and relocating golden eagles - is vital to creating an informed public and the survival of the island fox. When you support Friends of the Island Fox’s education efforts, you help create a community that actively supports island fox conservation. More about Santa Cruz Island & Island Journal. In 2006, Friends of the Island Fox provided funds for 10 radio collars, visited schools from primary grades through college and educated 1000s of people like you about the island fox at six different community events. This season Give the GIFT of A FUTURE. 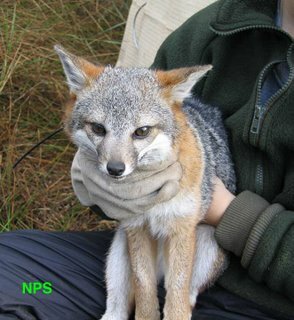 Through the efforts of like-minded people, we will SAVE the ISLAND FOX.